On Saturday we welcomed Claire, the winner of the competition in the Riverside Journal, who came to take up her prize of a trial lesson. It looks from the smile as though she enjoyed it. It was a busy day at the launch point despite the approach of Hurricane Katia. 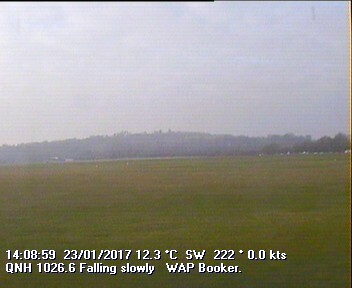 The instability gave opportunities for long soaring flights for some members, and our Trial Lesson and Course members also made good use of the conditions. 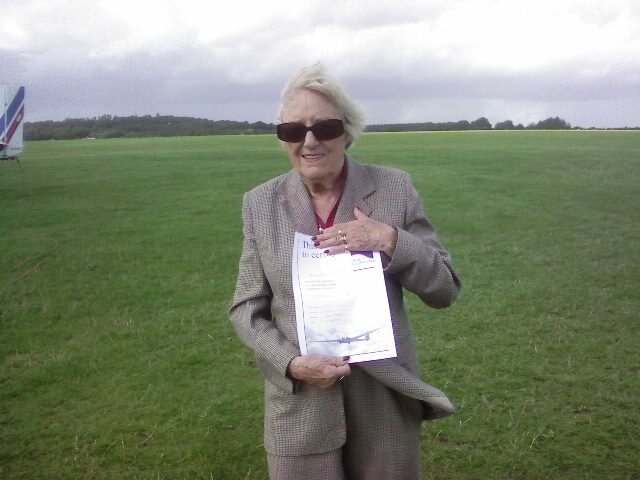 One of our visitors was Frances who was celebrating her 90th birthday with a glider flight. Her family's concerns about possible turbulence were brushed aside when we learned that she was just back from some off-roading in the Falklands. We look forward to her returning with some of her 10 pin bowling gang. We had a good outing to the Henley show today. 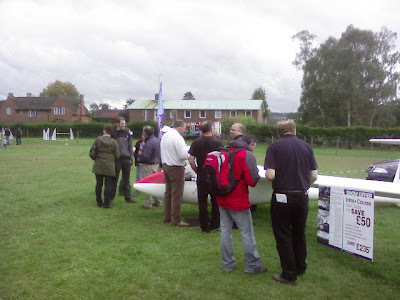 The cold front produced only a few gusts and some spots of rain and we had plenty of visitors to our stand whom we look forward to seeing again at the launch point very soon. Many thanks to Davids F and H and John H for helping out, and to Bobs D and S for help with setting up and taking down the stand. The season hasn't finished (yet). The 1st September brought a reasonable forecast and several members took advantage of what the day offered. First cumulus clouds were popping before 09:30 and the day looked to be over developing but fortunately didn't even if the cloud base took a long time to get above 2,500ft. JIM, JC and 315 set off on 270k tasks, first into the Cotswolds and then across to East Anglia before returning home. Paul Wigginton (this seasons tuggy) also completed his Silver Distance flying a Peg to Enstone. Not the best or easiest of days but great fun for those that flew. Other achievements during the week include conversions into the Pegasus 318 for John Lambie and Stuart Whiteside. Today also resulted in a first solo for Nick Merveldt in CFA which he also managed to soar for 40 minutes. Congratulations to them. The overcast and low cloudbase prevented launching early on Saturday morning and we were fortunate to see a good formation take off of the Fiat G-46 and Yak 50 to then join up with another Yak 50 presumably off to an air display somewhere. All didn't go quite to plan for the Fiat which suffered a minor technical issue with its undercarriage and it had to return to Booker - the pilot dealt with the situation very professionally and it was off flying again later in the day.